the rain has been the main character here on the hill. the other night trying to beat the downpour i found myself outside with a wrapped scarf of sorts and my wellies trying desperately to convince the chickens and ducks to retire for the night in the safety of their dry coop. as i closed the door to the coop which sits just at the forest gate, i could not help but feel compelled to grab my camera and take a walk into the foggy woods. there is something so hauntingly beautiful about fog dancing through trees. the forest floor is covered with bright green ferns mingling with thick dark barks and contrasting branches it is all so lovely. you can't help feel as if magically you have been transformed from a person to an insect or a bird. sometimes i dream i have an old phonograph that i can bring with me, i would set it down on moss covered rock and play a symphony, let it serenade the ever so giving forest. I can feel how autumn is creeping in over your farm, and I am so happy that you will share it with us. Hauntingly beautiful is how it seems to me too. The land just after the rain or in a fog is so rich and alive it makes my heart hurt and feel a sadness at the same time. so haunting. these pictures gave me chills. we've had hazy skies all day due to the wild fires here. like an enchanted forest. so so beautiful. I totally know what you mean, Nadia! As much as I love warm weather and blue skies, there's something so comforting about the fog to me. Beautifully expressed! Fog is a healer for the soul! The first and last photos, well, to say I love them doesn't quite do it. To steal a line from the most recent film adaptation of "Jane Eyre", they "transfix me quite"
oh Tolstoy-- he has stolen my heart! 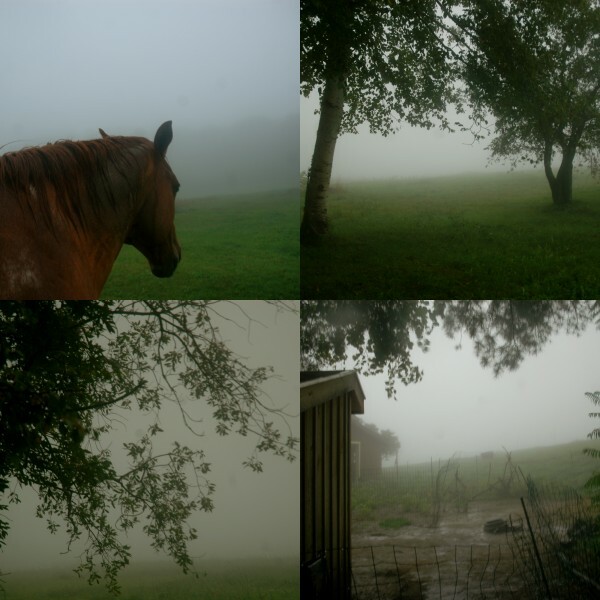 i LOVE the misty air in these pics!!!! Sunday was the first foggy day of the season, here in Italy. Fog covered branches, covered people, windows and cats. Fog made things disappear and then appear again. Fog reveals and hides. Fog is such a quiet place.